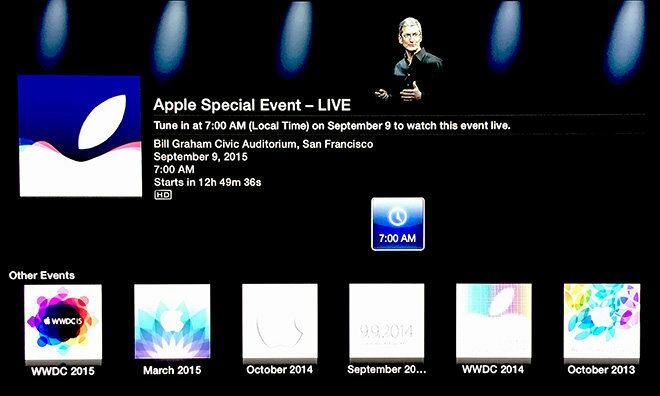 Apple has updated its "Apple Events" Apple TV channel in preparation of Wednesday's expected iPhone unveiling, adding details about the venue and a timer counting down to a keynote livestream that starts at 10 a.m. Pacific. The update is identical to last year's Apple Events channel revamp for what turned out to be the introduction of iPhone 6 and 6 Plus. For 2015, Apple is teasing its Siri virtual assistant as the show's focus, writing "Hey Siri, give us a hint" on press invitations that went out at the end of August. Aside from the countdown timer and brief event overview, the channel's icon now features the Siri-esque Apple logo graphic that first appeared on invites and later on flags and banners adorning Bill Graham Auditorium in San Francisco. The large 7,000-seat venue has been retrofitted with various decorations ahead of Wednesday's event, including a large Apple logo mounted on the building's ornate windows. While OS X, iOS and Apple TV device owners have for years had access to Apple's events livestream, this year's presentation marks the return of compatibility for Windows 10 users tuning in through the new Microsoft Edge browser. Apple is expected to announce next-generation iPhone handsets with Force Touch capabilities as well as new Apple TV hardware at today's event. Siri, the star of Apple's presentation, should play prominently with enhanced capabilities in iOS 9 and integration with a more robust Apple TV operating system. AppleInsider sources also say Apple's new smartphones will feature always-on "Hey Siri" voice activation. AppleInsider will be reporting live from the event when things kick off at 10 a.m. Pacific., 1 p.m. Eastern.